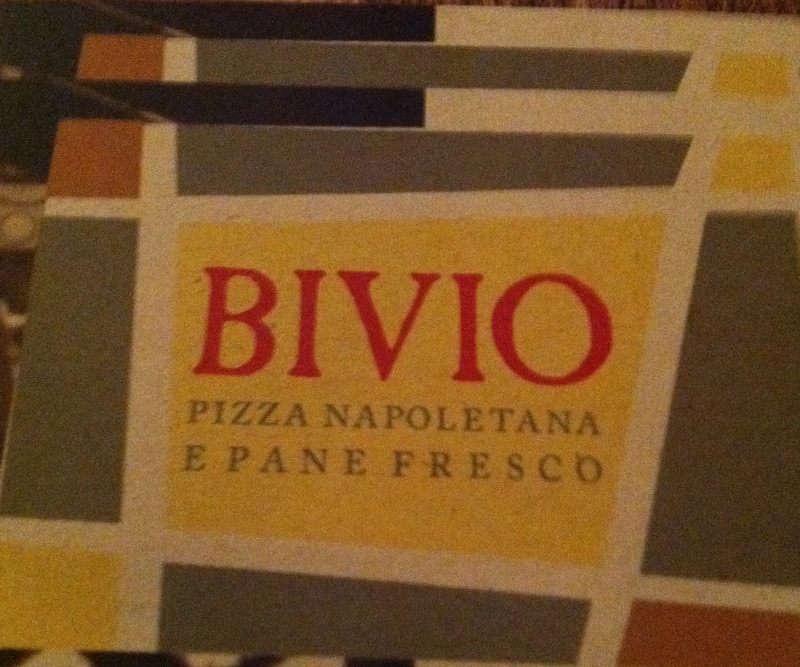 Bivio. Translation: fork in the road. A fitting name for the newest pizza spot in the area. Not only because it sits literally at a fork in the road, but for the play on words. However, I've been there twice since they opened a week ago and have never once used a fork! 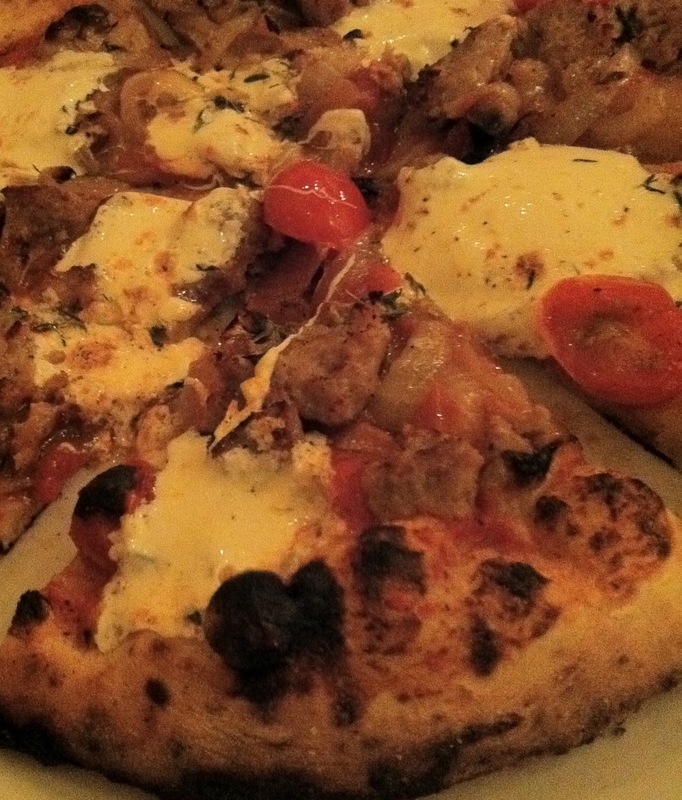 This is pizza that begs you to pick it up - you want to feel the silky dough that wrought this glorious crust. You want to lick your fingers of whatever crumb or topping may have fallen off. I've written about pizza before (in New Jersey, pizza is almost our national food) but this is different. This is pizza straight from the coast of Naples. This is the stuff "pizzanistas" dream about. Bivio is the dream of Jackie & Tomasso Colao - a small, cozy spot where Tomasso works the dough into little discs of heaven, and Jackie welcomes customers like you are a guest in their home. 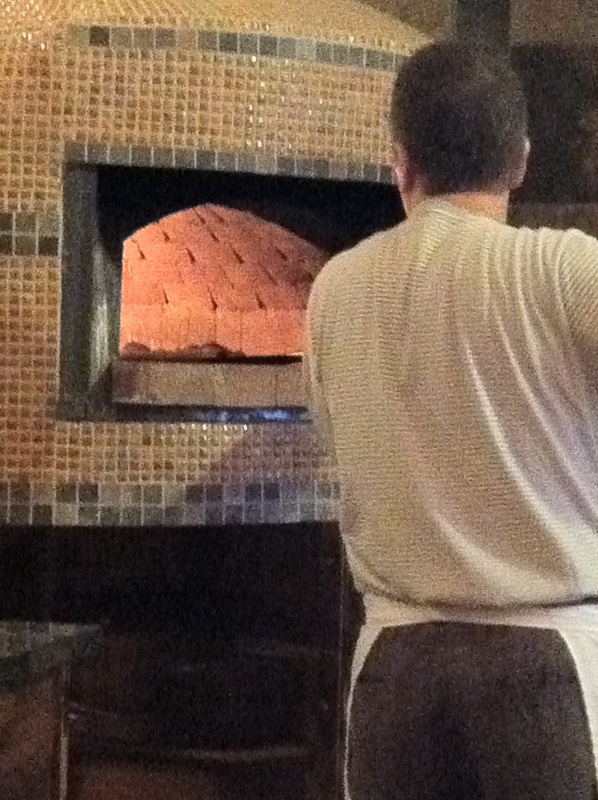 The wood-burning oven, made in Italy, is modeled after the ovens used in the bakeries of Pompeii. When we were in Pompeii, the ruins of the bakery were the most fascinating to me. According to Tomasso, the oven is almost up to the right temperature for him to start baking bread. And what a fine day that will be for those of us longing for real, artisanal bread close by. The menu is small - a few salads, 5-6 pizzas, and 2-3 desserts. The arugula salad we sampled the first night was delicious, sprinkled with lemon juice and shaved Parmesan, the leaves not at all peppery. The simple dressing of EVOO was lovely but just a tad too light-handed for me. Ever since our first trip to Italy about five years ago, we have been hooked on porcini mushrooms. 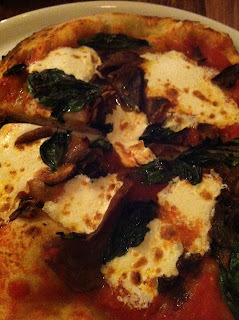 So when we saw the Porcini pizza on the Bivio menu, we were thrilled. Tomasso rinses the mushrooms before soaking them to bring them back to life. Then he adds San Marzano tomatoes, fior de latte mozzarella, fresh basil, EVOO, and sea salt. The result is divine. The true test of any pizza maker worth his salt, is the ability to make a fine Margherita pizza because this is as simple as they come -- tomatoes, olive oil, fresh basil, mozzarella, and sea salt. And here Bivio does not disappoint. But the real star of the show is the crust. Not since Italy have I had crust like this. Working the pizza oven by himself, Tomasso knows just how long to bake it (about 90 seconds to be exact) to get a perfect pie. Some say the secret is in the flour (00 flour from Italy), but true aficionados know it's the combination of quality ingredients with a master's skill. Tomasso told us that this is just the way he grew up. Going back the second time, we tried the special pizza that evening, which was crumbled sausage with sweet sauteed onions, cherry tomatoes, and mozzarella. Again we were bowled over! The simplest ingredients combined to make one of the best pizzas I've ever had. 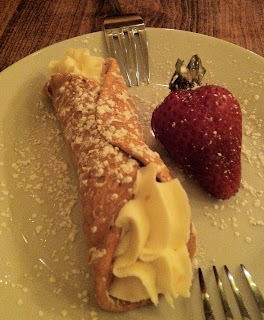 We saved a little room that night to sample dessert - homemade Tiramisu, homemade cannoli, or fresh berries with house made cream. Such choices! We went with the cannoli and were so happy. The ricotta cream was not cloying, as sometimes is the case. Instead it was light, with just a hint of sweetness, and piped into a crisp shell. It was paired with a delicious, huge strawberry.